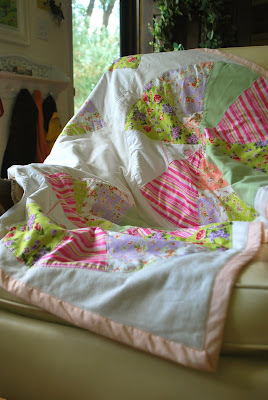 I started this quilt a while back as a gift for someone. It has been a slow going project. Not because it was terribly difficult but rather it kept getting pushed to the back burner to finish State Fair entries, stuff for the store, and other gifts. Finally this weekend I buckled down and finished it. 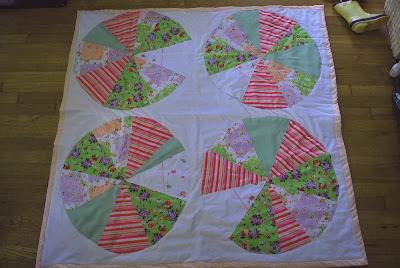 I have another quilt top up in my studio space waiting to be finished. I am having the hardest time finding the perfect backing fabric though. I carry around a swatch of the quilt fabric in my purse but can't seem to find anything that coordinates with it at our local shops. Tonight we will go and pick up my fair entries in Louisville. Unfortunately we never actually made it to the Kentucky State Fair this year so I have no idea if my entries won. I'll let you know tomorrow! Our tomatoes are finally turning red and ready to be picked. Unfortunately the ground squirrels have also figured this out and have taken nearly half of them before we can get to them. They take them off the vine, eat the seeds, and leave the rest of the beautiful tomato strewn around the yard. Seriously~ over half of our garden goodies have gone to feed the neighborhood wildlife this year. Still we have a good amount of tomatoes coming in which means I'll start canning them this weekend. Mike is going to can some salsa and I'll can diced tomatoes to use throughout the year. This past weekend was absolutely beautiful here in Lexington. The weather was unseasonably cool and unseasonably cool weather equals one happy mama! Canaan is fully aware of this fact. Each time we have a cool, overcast day he says "ooh, mommy, its your favorite weather!" Indeed there is an extra spring in my step on days like those. On both Saturday and Sunday morning I went out onto the deck and snuggled up on the Adirondack chair with a quilt, tea, and some quiet time Bible reading. In every other season, this is an almost daily occurrence, but in the summer the sun is already beating down and the mosquitoes are out before I can get out there. The mug in the photo is a mug that Mike and the boys made me for Mothers Day this year. They went to Starbucks and got to use some special pens to draw on the mug and write sweet little messages. I love it. 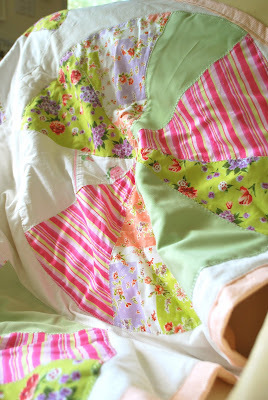 The quilt is very simple yet special to our home. It was the first sewing project I ever did~EVER~ and I made as a gift for Mike while we were dating. The Chickens Are Growing Up! I haven't posted much about the chickens recently. 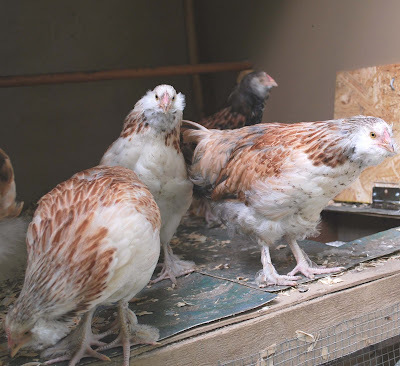 They are now a little over 2 months old and are living in their outdoor chalet. Mike built them a great coop with a little screened in porch down below where they hang during the day while we are gone and a large free range area to roam around in while we are here and can keep an eye on them. Their coop has a vent up top for air flow and a little side window. The large door swings open and on days like today (70 degrees and breezy) I leave it open so they can come and go as they please. They actually really like their coop. It doesn't take much convincing to get them to come in from free ranging. There is a rod in their that they perch on and relax as well. I clean it out every day or two. It doesn't smell at all or attract flies. They do have a hawk that has found them and likes to taunt them~ hence the reason they can't free range if I am not nearby. We have five chickens but as they grow we have learned that one is actually a rooster (he has all black feathers), not a hen, so we'll be selling him and keeping the four hens. We hope to have our first eggs by October but that part is a bit more unpredictable. The "gals" (as I call them) are so incredibly sweet. They have never displayed any aggression at all. They love when I pet them and they talk up a storm to me when I go out to see them each morning. 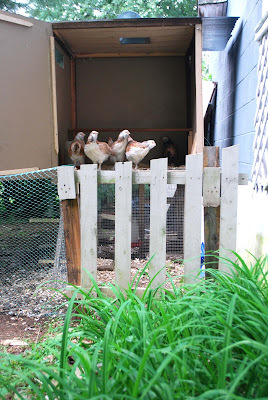 Besides the fact that I like to maintain a clean coop, they are very low maintenance. We fill their feeder about once a week and during these summer months fill their water about once every 3 days. We can leave for a weekend and they do fine. I don't think it gets any easier. I thought his leaving for Kindergarten was so sad...first grade is sad too. It means my little boy is growing up. He is so excited to start at his new school this year. This summer he was given a grant to attend a wonderful private school here in town. It is an amazing school~very hands on, creative, academically challenging, and full of extraordinary faculty. We feel very blessed that he has this opportunity. Each night he thanks God for being able to go there. I know it is going to be a fantastic opportunity for him and will help him continue to thrive and excel academically. Ezra will be out of sorts for a few days, I'm sure, after having a fun filled summer with his brother. They fought (alot), but also grew in their relationship. As Canaan walked to the car today Ezra yelled "I love you Canaan"! Ezra isn't one to express his feeling through words as much so this was just absolutely precious. Lots of down time around here. Lazy summer days just building forts, riding bikes, barely cooking, playing with toys that have been tucked away for months, feeding the chickens,and reading lots of books. Most evenings the boys pull out their sleeping bags and settle in for an evening movie we pick up at the library. Sometimes this includes popcorn and hot cocoa but not everytime. Part of our "down time" is due to the slow pace our summers usually take on. But this year our summer has taken on a particularly lazy feel becuase of another reason...I am pregnant! I have tried all of those supposed remedies out there...all with no avail. I have the prescriptions too which I try to avoid as much as possible unless it all becomes a bit too much (like last Monday's throwing up every hour from morning till night). 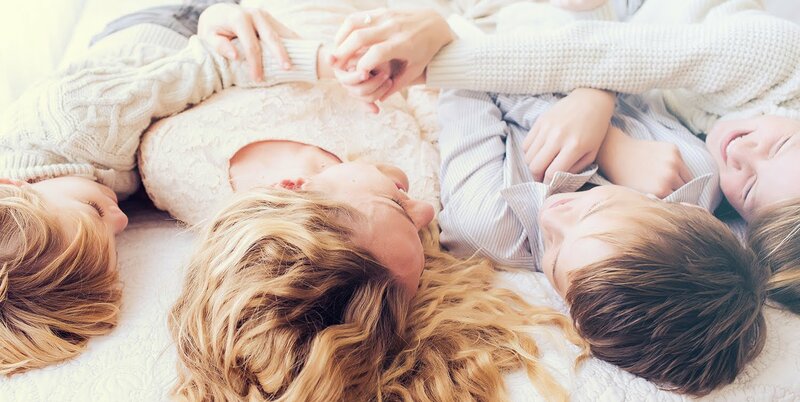 But despite the sickness, in the end it is well worth it to have another precious life in our family. The due date is estimated at the end of February~given my two time record for being well overdue, I suspect I'll deliver at the beginning of March.